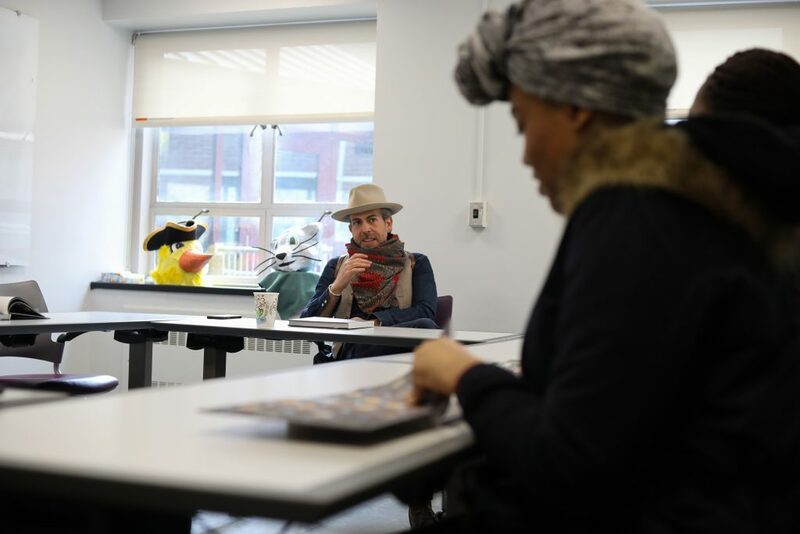 Rose Coschignano/Pipe Dream Photographer BU alumnus Day Schildkret, ‘00, sat down with students to discuss his book and art. On Wednesday, April 10, alumnus Day Schildkret, ‘00, sat in the back of the Harpur Edge office wearing a fedora, scarf, ripped jean jacket, metal bracelets, vest, leather pouch, jeans and boots. Earthy and free-spirited, he looked exactly how you would expect him to if you opened his new book, “Morning Altars: A 7-Step Practice to Nourish Your Spirit Through Nature, Art, and Ritual.” Around the square table, nine students listened attentively as Schildkret read from his book and led a signing and Q&A session, hosted by Harpur Edge’s book club. In addition to being an author and artist, Schildkret is a public speaker whose talks about spirituality and mental health have been featured in Vice, BuzzFeed and several mental health magazines. He was even invited to speak and lead sessions in the Google offices in Silicon Valley. His book features images of his “morning altars,” which are works of geometric earth art composed of materials like flowers, leaves, shells and branches. Schildkret also includes images of the destruction of the art’s natural components, like flowers wilting. Alongside these images, there are messages about connectivity with nature, others and oneself, as well as traveling, meditation, prayer, creativity and the process of letting go. During the event, he read sections of the book ranging from tips on connecting oneself to nature to a guided 10-day silent meditation. Sources of quotes scattered throughout the book range from Aristotle to Oscar Wilde to Native American elders. Schildkret said his work comes from learning to let go. According to Schildkret, another important part of the “morning altars” is that they are not permanent. Because of this, Schildkret believes they help those creating them learn how to let go and deal with the process of loss. Schildkret touched on this during the talk. “Because my art is impermanent, it forces people to ask themselves, ‘How do you respond to change? Are you in resistance to it? Are you scared of it? Are you in denial of it? What would happen if you had a much better relationship to change, so when it happens in your own life you’re not showing up as an amateur, you’re showing up with more skill?’” he said. Regarding students of Binghamton University, Schildkret said he wanted to speak directly to areas where they could need help.